not sporting don't you know! While the Silent Service still struggles for recognition because of the nature of their tasking (i.e., spying in various forms), they quickly proved their value during WW I and the first subs back into port after a successful mission, proudly flew the Jolly Roger relishing in their pirate mantle. Thereafter, pirate rig (dressing for the less than savoury environment of a submarine) and hoisting the Jolly Roger has become a firm tradition. 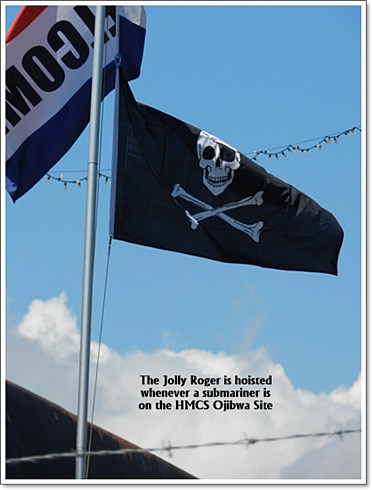 The Elgin Military Museum has taken a leaf out of that book and proudly hoists the Jolly Roger whenever a submariner is at HMCS Ojibwa. As to the scalliwagerie - read on and make your own assessment! 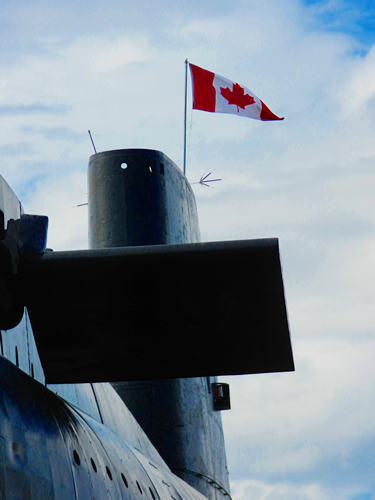 While their boats may be the subject of derision from time to time by those on the periphery, the Canadian submariner does not take a back seat to anyone. They are highly skilled professionals to a man - each able to take on any part of running the boat in an emergency and in the dark. Their commanding officers in Ojibwa's day were the product of what was recognized as the most difficult course for military personnel in the world - the Royal Navy's Perisher. It is odd that men of this ilk have received so little public recognition, then again perhaps not. They are indeed the silent service; the very nature of their operations is known to only a few. Most of us will never know exactly where they have been and what they have done. Nuclear submarines may have more bells and whistles than boats such as the Oberon class diesel-electric Ojibwa; however, they do not have her ability to be absolutely silent - 'who knows where the shadow goes'. Fortunately, we have a small window into this world via the stories - at least the printable ones- of retired submariners. Lucky Gordon has a Perisher story - his view from below as he states it. Perisher is a course for aspiring commanding officers only. That is not to say that those below this rank are not well trained, indeed they are trained and tested and retested endlessly in a way that no skimmer can imagine. To paraphrase one commentator: If a surface ship loses its crew or if the engines fail, the ship will still float, if the crew of a submarine falters or the engines fail, the boat and all aboard end up at the bottom of the ocean crushed by the pressure of that environment. It is called cavitation; it means death. Submariners are a rare breed.